New members are always welcome - whether you're a veteran paddler or have never tried it - come down and join us next to the boat ramp in Oceanside Harbor for our Newcomer Paddle on the 2nd and 4th Sunday of every month at 10:15 am for prospective club members. You must live in the north county San Diego area to take advantage of this opportunity. You are welcome to try four newcomers paddles for free, before we ask you to join. This is a recruitment paddle for prospective members of our club only. Please respect our club and volunteers. If you would like to organize a paddle for a family, group or organization, please contact any of the officers, coaches or board members. We accept donations for special paddle events. Outrigger paddling is for anyone who loves great fun and exercise, who enjoys being on the ocean, who wishes to experience a water sport with a lengthy and rich tradition in Hawaiian and Polynesian cultures, and who is a proficient swimmer. No previous experience is necessary to enjoy outrigger paddling, though knowledge of the water through other water sports can be helpful. Paddling outrigger canoes can be both peaceful (picture being out on the water in the stillness of an early morning or as the sun is setting) and invigorating (racing!). To determine if joining our club is for you, just attend one of our newcomer paddling times, and wear appropriate clothing such as swim trunks/shorts and synthetic fiber shirts (though cotton is okay) since paddlers can get a little wet. Depending on weather and time of day, also bring a hat, sunglasses, wind proof jacket, and wear sunblock. Canoes and paddles are provided. Do not bring valuables, there is no save place to store personal items. Children must be a minimum of 10 years old, must be accompanied by an adult and must be proficient swimmers. Oceanside Outrigger has Newcomers Paddles on the 2nd and 4th Sunday of every month at 10:15 am. We'll provide you instructions and introduce you to this great sport. Our club is located at Oceanside Harbor, Oceanside, California. Coming from either North or South: From Interstate I-5 take the Oceanside Harbor Exit. Continue west towards the harbor. Turn left into the harbor and continue left on Harbor Drive South. Take "Harbor Drive South" around the shopping center until you reach the stop sign. At the stop sign, make a right, and continue down the road to the boat ramps on your right. 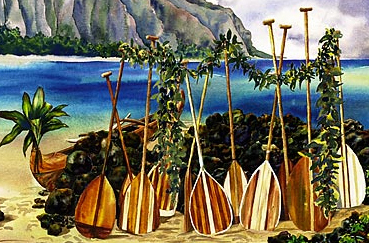 We meet by the outrigger canoes which are stored next to the boat ramps on the east side of the parking lot. Parking is difficult, please allow a minimum of 30 minutes for parking and walking to the canoe yard. We don't wait for stragglers because the canoes leave the docks promptly. Once you enter the Harbor (at the Y) make your first left under the railroad bridge for free parking. Parking near the boat ramps is $5.